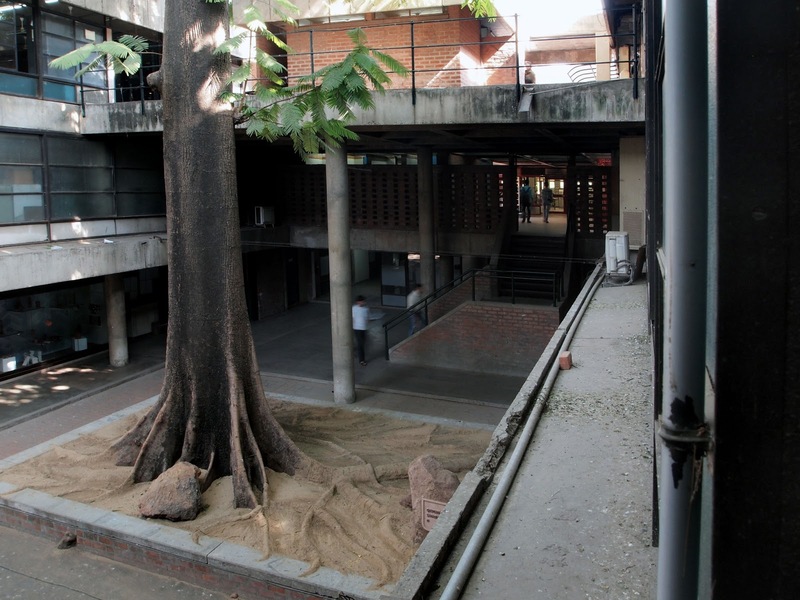 Recognising the Roots: NID accorded status of "Institute of National Importance"
Recognising the Roots: Indian Cabinet approves status of an "Institute of National Importance" for the National Institute of Design, Ahmedabad. Sand sculpture extending the buttress roots of the Big Tree in the Gira Gautam Square at NID Paldi in Ahmedabad created as part of the class experience of Media explorations by Textile Design students under the guidance of teacher Jayanthi Naik (J L Naik) last week. They must have had a premonition about the Indian Cabinets' forthcoming act of passing a resolution according the status of "Institute of National Importance" to the National Institute of Design, Ahmedabad at the meeting held on 10 January 2013. See PIB News release here. The National Institute of Design was set up in 1961 based on a report by Charles and Ray Eames called the India Report of 1958. In the past 50 years the Institute has had a remarkable journey of exploration and discovery that was informed by the spirit of the India report but the Government that had set it up with a great deal of vision and enthusiasm in 1961 seemed to have been all but forgotten over the next 50 years with the Institute being managed by a small department within the Ministry of Industry while the other major national institutes such as the Indian Institutes of Technology and the Indian Institutes of Management were placed under the Ministry of Education which is now the Ministry of Human Resources and they were accorded a status of importance that NID was never given for over 50 years of its existance. The return of the echo of the dramatic roots in the sand sculpture by Naik's students somehow reflects the Governments belated recognition of NID and its value system and the contributions that it has made and the critical role that it can make in the building of the nation in the years ahead which now becomes possible with this significant act of recognition. NID can become an equal partner in the journey of nation building in the years ahead along with the other streams of knowledge that are already recognised and well funded. We should not let this occasion slip into another bout of extended amnesia since it is so easy to forget the contribution of design since most of it is intangible and hence cannot be measured by the yardsticks of science, technology or management and it needs to be sensed and felt long before the hard measurements begin to make sense. The dramatic roots of the Big Tree at the Sarabhai plaza were covered up when the platform was built in their honour just as much of NID's educational experiments were undermined by the search for formal recognition from the educational systems that dominate India. NID went through the whole process of trying to get the status of a Deemed University in a mistaken level of enthusiasm that many of us had labelled "Doomed Univerity" since the search seemed to be for qualification and not competence and sensibilities that are so important and central to design action. I hope that the efforts to write the history of NID will look at these significant moments and efforts and contributions and not gloss over the shift to grades and marks (quantitative systems of evaluation) in search of recognition of a deep and stable educational system that was an experiment at NID (qualitative systems of evaluation) that needs to be cherished and perhaps used to inform all of higher education in India in the days ahead. We need to ponder on those values and processes of education that NID had built and through decades of hard work in the face of great opposition from outside as well as within and this is something from which so many of its alumni have found substance and sustenance to face the challenges of a very hostile Indian landscape for the uncertain and the new that has been India of the past 50 years from our experience in the lack of recognition from both India Governments as well as from Industry. This is not surprising since we live in a very controlled economy even with all the bouts of liberalisation and design can only flourish when there is real competition and an open economy and India is now heading in that very direction and design will be the core activity going forward from here. 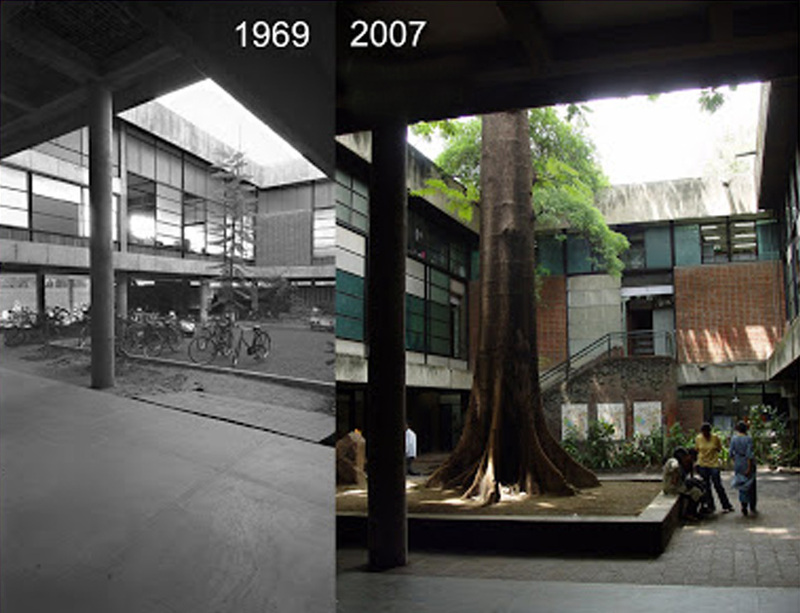 What are those roots that have been covered or even lost at NID and in Indian design as a whole when design education was struggling to find its feet in the larger Indian eco-system? The gradautes and alumni of the school must ponder about this and help articulate what may be taken forward and this is a call for such an articulation since we do need a new imagination for design education in india that can inform the next 50 years or more. These roots must be uncovered and revealed and from this uncovering we will reflect and build new knowledge that will help us navigate the future in the days ahead. 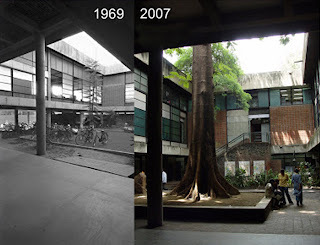 The Big Tree when I joined NID in 1969 and later in 2007 after the platform was built. NID needs to take on the mantle of leadership that has been bestowed by this act of Government and build models for designerly thought and action across the 230 sectors of our economy and not remain restricted to the pandering to the needs of large corporate industry and their short term needs for car styling and graphics when the country needs serious design investments in urban mobility and public transportation, just to give one example where we need to shift our emphasis in real earnest. We need to enumerate such actions and extend these concerns across the 230 sectors of our economy in as many conferences and workshops that may be needed to reach out to stakeholders and build a new agenda for action in the days ahead. We need to invest in design faculty and the young designers coming out of our schools so that they may serve the real clients, the people of India in addressing their needs with imagination and sensitivity as wel as design expertise and not remain happy with the Jugaad - patchwork quilt of poverty driven innovations for India - that seems to be celebrated by management gurus as the core capability that the world is talking about as the only major innovative ability of India today..